The youngest designer to debut at Lakhme Fashion Week, Kunal Rawal has definitely redefined men’s fashion. Many Bolly stars swear by his style – actress Sonam Kapoor, who has known him since she was three and calls him her “Chaddi Buddy”, speaks highly of him as also Shahid Kapoor whose outfit at the performance at Global Indian Film & TV Honours 2011 was designed by Kunal’s label DStress. 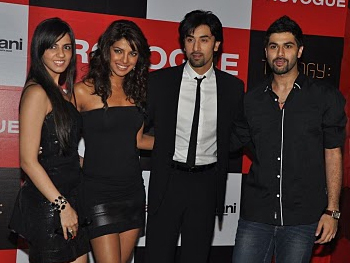 Starting his career in Bollywood with Aisha, Kunal will now be seen designing the look of Desi Boyz. He speaks exclusively to BollySpice about this. What was the brief that was given to you for Desi Boyz? Did Rohit give you any particular pointers? I have been doing fashion shows and I have my label DStress and have got into costume designing only about a year and a half back. So there’s that shift from being able to do whatever I want to designing costumes for movies. You need to have a heart-to-heart with the director to know exactly what he is looking at because these characters are your director’s characters; he has created them so he probably knows them much more than you do. So the idea is to just get a brief on what the characters are like so you could stick to the script and give the director what he wants so the clothes don’t overpower the actor or his performance and the same time, give something really fresh that will keep me happy. wonderful. Because fashion is just not about the look, it’s also about how you carry it off. And it’s a good performer who makes the clothes look really nice. What are generally your sources of inspiration while designing any look? The idea was to be real. 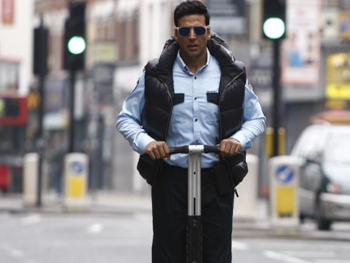 Akshay’s character is set in one of the most fashionable cities of the world, London. So the contrast of a real character set in a very fashionable place was challenging. I have studied in London and lived there for some part of my life so I picked up a lot from my personal anecdotes. It wasn’t just about what he was wearing, it was also a lot about how he was wearing it. How involved are the actors generally when it comes to the look design? Akshay Kumar was tremendously involved in the looks and the style of his character in the movie because a- it’s a London based movie, and b- he has a very interesting character graph in the movie. I believe costumes are as important as a DOP or how a shot is going to be taken. Hair, make-up, costumes…these are things that help an actor to get into a character and perform. We had a couple of group discussions and trials where we tried on a couple of things. After the first meeting I think he was pretty confident about what I had planned for the movie and for the different phases his character goes through in the film. As a creative person do you prefer being left alone to your creative space or would you not mind inputs from different people associated with the venture? Which is your favorite look on the boys in the movie? The aviation suit that I made for the Desi Boyz title track was very exciting because personally I like to create costumes for movies, I don’t like to just style. So we created the aviation outfit from scratch and it was really fun. Another challenging but exciting design was for the song Subah Hone Na De. The concept of the song was that it’s a party song where the guys are just ripping bits and pieces of their shirts off. So it was very interesting to work with Rohit and Bosco, who is the dance director of the song, because I had to create the outfits in such a way that every seam had to be a rippable seam but to the camera it should not look that it could be ripped. And with the choreography coming in, there are certain dance moves which you have to make sure do not alter the outfit and at the same time there was a proper plan of the shots of what goes off. I think that song is going to make a great fashion statement- purple’s back! The boys are looking hot in purple. What’s the coolest thing about your work Kunal? The amount of learning that you get to do. We keep moving from project to project; whether its movies or being a creative head of Provogue (two years back). I am also designing the look for Shankar’s Tamil remake of 3 Idiots (Nanban), I have also designed the look for Mahesh Babu’s movie Dookudu – a Telugu movie which released sometime back and has done really really well – so I just pick up work that teaches me a lot and through it I get to learn many diverse things. Designing is a creative field where you get to create something new. And also we are really fickle people, so moving from one project to another is a complete shift of environment and provides loads of challenges. What are the issues a designer generally faces while styling the look for a movie? What constraints do you have to keep in mind? There is a very thin line between trying to create something fresh and staying true to the script. At the end of the day, you do not want to overpower what the character is, what the story is about. At the same time you want your clothes to be noticed in the movie. So it’s important that you work with the right kind of people; people who understand what you do and why you are there on board that project. Along with the script, you have to keep the character graph in mind. Akshay’s character is very interesting and I hope the audience notices the different changes. We make an emotional graph of the character and the clothes have to follow the emotional graph. So if the character is happy, you end up giving him slightly more cooler colors or neutral colors compared to the point in the movie where the character is slightly upset or angry or falls in love then more warmth comes into the clothes. Also we have to keep in mind, the shooting schedule, so that’s one constraint which we face. Maintaining continuity is another one but that is relatively easy. Tell us something about the look of Akshay in the movie. whole “Desi Boyz” phase, as we call it, where they have a slightly glossier look as it’s about their job. So I got to use a lot of more fashionable elements and I hope they make a trend in the year to come . And it kind of ends with a slightly prettier look. As a costume designer, I don’t like to style too much and pick up from stores, I rather create stuff that is made for the movie and stays patented in the movie and not goes anywhere else. Thanks Kunal for talking to BollySpice. 17 queries in 0.752 seconds.